Durham mugs are one of our best selling printed promotional mugs which are often used as a promotional giveaway. The Durham mug is an ideal way to get your message across at an outstanding price! This spectacular mug can be printed using various print methods ensuring all corporate images and logo’s can be portrayed. 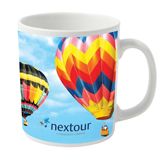 Dye sublimation print technique will allow you to personalize your promotional mug with a photographic image giving your promotional mug true visual impact. As well as being a great promotional tool the Durham mugs are designed to be slurped, sipped and dunked from. These promotional mugs are 100% dishwasher & microwave proof which makes these mugs a great promotional item or for free giveaways at corporate trade shows and events. The promotional Durham mugs come in a wide range of ceramic colours as standard. The WoW Mug is created by applying a coloured heat sensitive coating to the outside of a Durham ceramic mug, which is then personalised using the dye-sublimation print process. When hot liquid is added, the heat sensitive coating becomes transparent revealing the printed image beneath, strong and bright. As the printed mug cools, the heat sensitive coating is restored to its original colour. The WoWMug may also be screen over-printed with a permanently visible message to convey the brand or advertising message when the mug is cold. 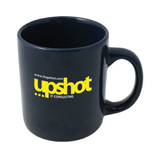 Available in a choice of heat sensitive coating colours (if the image is printed on a dark coating, it is only faintly visible when the mug is cold. On lighter coatings, the image will be more visible). Whilst this promotional product is safe to use in some dishwashers, it is not guaranteed to be dishwasher safe and we advise that it is washed by hand. If you're business is looking for a promotional mug that can't fail to attractive attention, the Wow Mug is well worth considering.